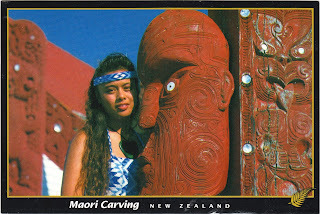 Postcard NZ-91131 from New Zealand, showing a Maori carving, arrived on September 13, 2013, the 6th anniversary of the adoption of the United Nations Declaration on the Rights of Indigenous Peoples by the United Nations General Assembly during its 61st session in New York City in 2007. According to Wikipedia, the purpose of the Declaration is to "set out the individual and collective rights of indigenous peoples, as well as their rights to culture, identity, language, employment, health, education and other issues". It also "emphasizes the rights of indigenous peoples to maintain and strengthen their own institutions, cultures and traditions, and to pursue their development in keeping with their own needs and aspirations". It "prohibits discrimination against indigenous peoples"; and it "promotes their full and effective participation in all matters that concern them and their right to remain distinct and to pursue their own visions of economic and social development". The goal of the Declaration is to encourage countries to work alongside indigenous peoples to solve global issues, like development, multicultural democracy and decentralization. There is a major emphasis that the indigenous peoples will be able to protect their cultural heritage and other aspects of their culture and tradition. On the postcard, it noted "Traditional Maori carving designs feature human or near-human figures, with the spiral also an important element."